This is my small tribute to Tony Buzan, who died on April 13th 2019. He was the inventor of the mind map. Rest in peace Tony. On my smartphone I use Mindjet Mindmanager. 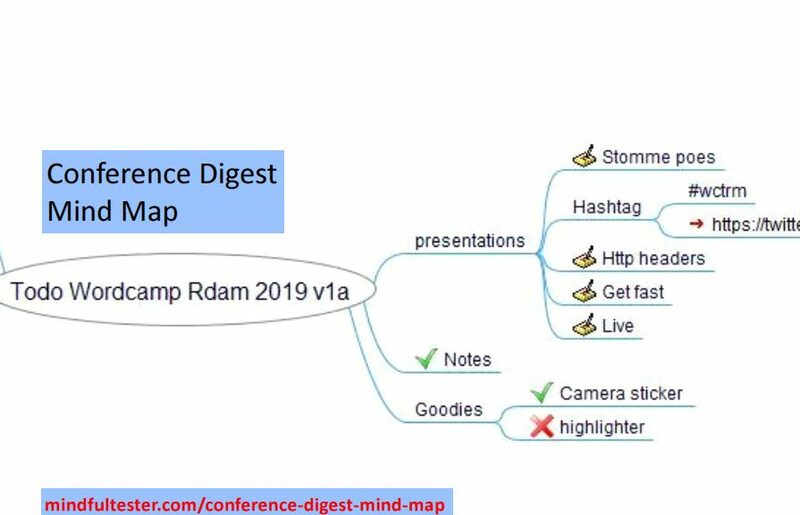 It is a rather dull looking mind map program. I can add colour, but that will slow me down. For me mind mapping is jotting ideas as fast as possible. My first action was to make my conference notes readable. My handwriting is quite awful. The use of sketchnotes did not improve the quality significantly. My notes were about WordCamp Rotterdam 2019. There were some really technical talks. It is almost impossible to translate technical stuff like settings of analytics programs or Cascading Style Sheets to images. Okay. The Notes branch was needed as a reminder that I would read my notes without thinking too long. Almost immediately I added a branch with presentations. If needed, I would read the presentations in slow speed. Just before blogging I realized I made an error. I opened Twitter search and entered the hashtag “#wcrtm” and “slides”. #wcrtm stands for WordCamp RotTerdaM. All the presentations of the interesting talks popped up. Another branch is Goodies. These are gifts of sponsors. I lost my highlighter somewhere. I marked this branch with a red cross. Then I remembered that I had a camera sticker from a previous conference, which I found and placed. So I marked this branch with a green V. For the English people: Jack in the box. I got some booklets / books about SEO or Search Engine Optimalisation, performance of a website and website security. The reason, that I did put this branch under the central object, was to balance the tree. This tip was given by a business consultant. The way I interpreted was that I had to avoid a mindmap with too few main branches. Back to my Books branch. This branch contained information which I could use. Not immediately, but it was something I could not put away lightly. The Goodies branch was more like: done and forget. Now comes the most important main branch in my mind map: Actions. Sub branches were added during my note cleanup. This website still had no proper 404 screen. Yes, there are some plug ins, but is there a more elegant way to solve this problem? Also too many plug ins will slow down my website. During the conference there were lots of configuration suggestions. As a newbie WordPress administrator I asked, how I could configure this. The answer was to contact the host provider. Actions from my side could collide with actions from the host provider. Bracing for impact. I still have to place a security.txt on my website. More information can be found in securitytxt.org. On the web I read some disturbing information about Xmlrpc.php. On the conference it was strongly suggested to remove it. Another action was to collect all my markers for future notes. A final action was to put extra information about text in my pictures in the Alt Text. Depending on my progress and feedback of my host provider I will adjust my actions in my mind map.